Re-release: Long deleted by Argo. 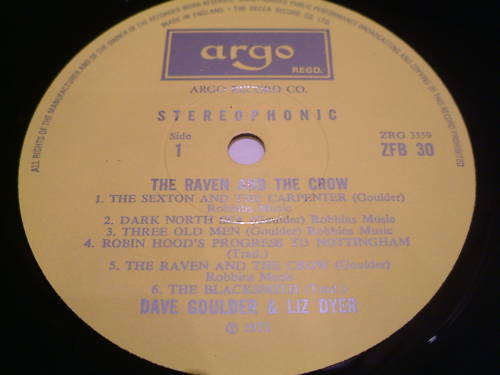 In 2006, the Japanese label Vinyl Japan brought out CDs of this and Goulder and Dyer’s earlier Argo LP January Man, describing them as “original recording remastered”. 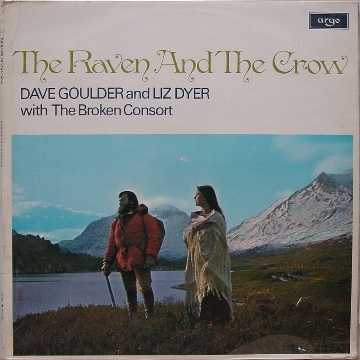 Digitally remastered CDs of both albums are now available from Dave Goulder’s website. ~ by folkcatalogue on June 19, 2009. Conrad Jelinek is trying to contact Lizzie. Conrad … I’ve lost you again. Moved house etc etc. I am on Facebook as Liz Dyer or as Cirdaneth on the Councilofelrond.com website where I moderate the books forum. Hope to hear from you. Great to hear this. In January this year I ordered & received The January Man & Stone Steam & Starlings from Dave’s site (both great albums) Earlier this month I tried to order The Raven & The Crow & Dave’s solo version of The January Man from them too but heard nothing back. I hope they are okay. I will try & e-mail them again soon perhaps but don’t want to hassle them too much if all is not well – so great to at least hear this track anyway!